Lisa Hannett has posted some very helpful advice about applying for grants from Arts oganisations. Lisa Hannett’s Tuesday Therapy series features the lovely Mary Victoria on “Inspirational Lemons”. Coconut Ice and Caramel Fudge for Christmas – huzzah!!! … the new Florence + the Machine album, Ceremonials and Lungs and wishing I could get a copy of Sourdough and Other Stories to Florence Welch. WA author Sue Isle is the author of the YA fantasy Scale of Dragon, Tooth of Wolf. She is an Aurealis and Ditmar nominee, as well as an Aurealis winner for Best Fantasy Short Story with “The Woman of Endor”. The delovely James Crossley raises a glass to Aitken’s The Monkey’s Wedding. 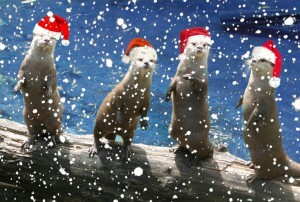 … an otter or two.